Posted on June 5, 2015 at 9:12 pm. Open again this weekend – walk the gardens and see the 300 plus camellias, 20 plus magnolias, vireya rhododendron and a few azaleas – then buy one or some or a whole bunch of camellias from the 5000 – approx – available. We have over 250 different varieties of camellias – sasanquas for the sun, japonicas, hybrids, species for those part shade spots. We will also be at the Maleny Garden Club ‘Gardening on the Edge’ weekend at the Maleny Showgrounds. Lots of plants for sale including Leonie’s roses and our camellias and lots more. Six local gardens open for garden visits. This is our first show of the season and we will have a great selection of camellias available. See us at Maleny or at the nursery in Palmwoods. 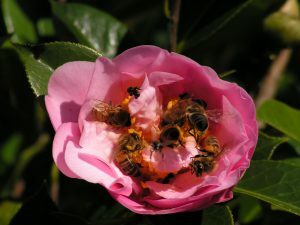 This is a great time to buy your camellias as the garden is full of camellias in flower. Planting now suits camellias as this is their dormant time – no growth – just flowers. Plant now and let the plants settle in before they start their new growth in Spring. 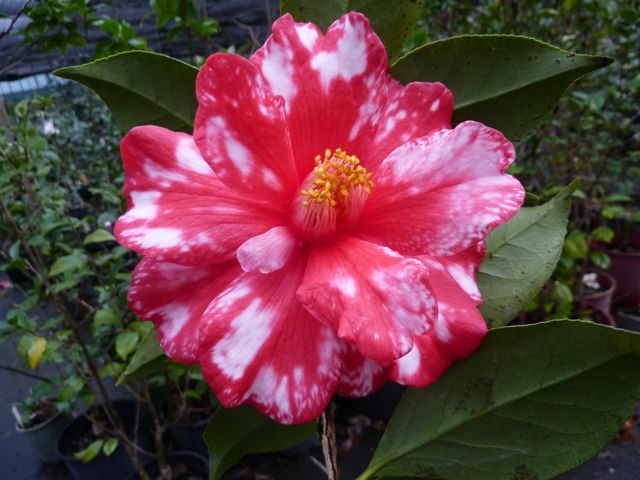 Camellias must have a well drained, acid soil. When planting, add course sand or fine gravel to heavy soils along with some well composted/matured cow, horse, goat, sheep, alpaca manures. The sandy stuff helps drainage, the manures enrich the soil. Always water in well and mulch to help suppress weeds and to insulate the soil and roots. Camellias will add great colour to any garden in winter and they also make a great garden plant during the rest of the year with their dark green, glossy leaves. Posted on May 1, 2015 at 9:51 pm. 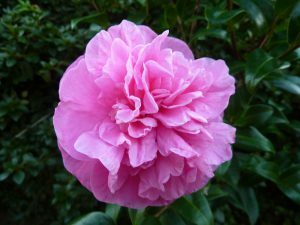 Camellias and Vireya rhododendrons will be available for sale this weekend – Saturday May 2 and Sunday May 3 from 8.00am till 3.00pm. We have had some rain – 200mm in the last 24 hours so the ground will be wet under foot – but you are still welcome to wander the garden and see the sasanquas in flower and the japonica camellias starting to bloom. There should also be some Vireya rhododendron flowering as well. 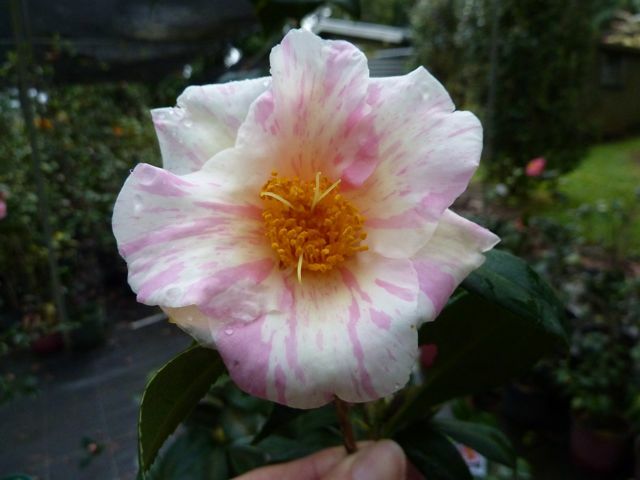 Lots of camellias – sasanquas, japonicas and hybrids – and a smaller number of vireyas – something to suit any garden. All our plants are in 140mm pots and measure between 30 and 80 cm – depending on variety. Now is a great time to plant your camellias – although they are flowering they are going into their dormant stage – so planting out now allows them to get settled in and develop roots in time for spring growth come September. Buying now means that you can see the flowers first. Remember, as basic camellia culture, camellias need a well drained and acid soil. Make sure your planting site drains well and raise the soil up a bit to help drainage. Always mulch and water in – even in this weather. Autumn is here and winter’s on the way – rug up and enjoy your garden. Find and Like us on Facebook – Camellia Glen Nursery. Posted on April 17, 2015 at 9:14 am. Camellia Glen will be open for visitors again this Saturday. we have hundreds of camellias – sasanquas for the full sun, japonicas for part shade, hybrids and a few species – all ready for sale. Walk around the garden and see dozens of sasanquas in full flower. The early japonicas are starting to flower as well. 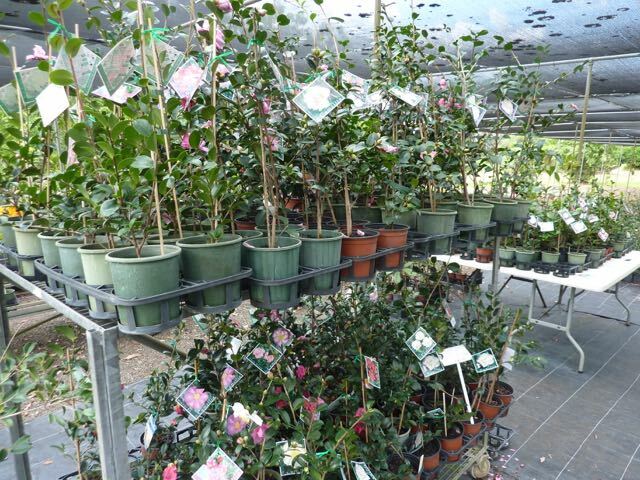 We have many hundreds of plants – about 50 varieties of sasanqua and some 150 japonicas for you to choose from. Plants range from 30cm for the slower growing ones to 60 to 80 cm for the taller growers. Choose something that will suit your needs. We will be happy to assist you with your selection process. We are also able to do mail order for small quantities – from minimum of 3 plant by mail to multiples of 10 to 12 by courier. East coast mainland Australia only. Come and brighten up your day – and your garden – with beautiful camellias. 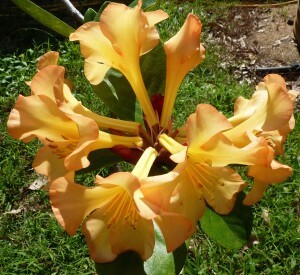 There are a small number of Vireya Rhododendron as well – some in flower. Open to the Public; Camellias; Direct from us. Posted on April 12, 2014 at 10:27 am. 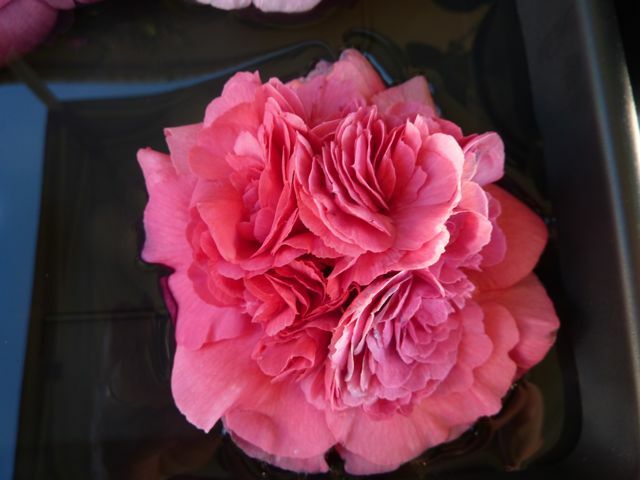 Camellia Glen Nursery is starting open days for the start of the camellia season – this weekend. See the schedule in our last blog. So we are open this Saturday and Sunday 12 and 13 April – 8.00 am to 3.00 pm. The sasanquas are flowering well; if you would like to see these in flower, the time is now. But where are the japonica flowers? At the Queensland Camellia Society meeting last Sunday, our VP David, from Toowoomba, was saying that they had flowers on 70 different varieties, and brought a lovely selection of flowers to prove it. One was Easter Morn – early even for that…. After some discussion, most other members in the greater Brisbane area agreed that the japonicas were late this season. One of the contributing reasons will be the lack of rain during the flower developing stage. It seems our Toowoomba friends hand water regularly, and this is the difference. Since most of us in SE Queensland at least, have received some good rain, we can look forward to a good season, if a little late in starting. With the big cyclone up north, there will be a lot more water and rain around – lets hope that these folk didn’t suffer too badly in the wind and the water heads out to those who are still in desperate drought conditions. We look forward to seeing some of you up here for our open days. We are often asked if we have much stock on hand. We grow all our own stock so what we have is what we have. We are a small operation – but there will be some 6000 plants across about 210 different varieties. This is enough to satisfy most. Posted on June 21, 2013 at 4:36 pm. Today has got to be one of the most miserable days we have enjoyed for some time – cold (well for us anyway), wet and dreary. But the plants will love the rain and it is a day we don’t have to irrigate. Notwithstanding the weather, we will be open to the public this weekend Saturday 22 and Sunday 23 June – 8.00 am to 3.00 pm. Posted on June 13, 2013 at 10:24 pm. What a fantastic weekend we had at the Maleny Garden Club Gardening on the Edge last weekend. Saturday was a beautiful day, Sunday not so much, but still a lot of people ventured out. This Saturday 15 and Sunday 16 June, we will have the nursery open to the public. Come and visit, wander the gardens, check out the camellias, vireyas, the reticulata camellia buds are showing some colour and I saw some magnolias as I drove past this evening. A few thousand camellias to choose from and over 200 varieties – japonicas for shaded/part shaded spots, sasanquas for full sun/part shade. Most in 140mm pots – nice little plants. Camellia Culture – someone asked me the other day that if they fertilise their camellias now, will they flower more. The answer is no. 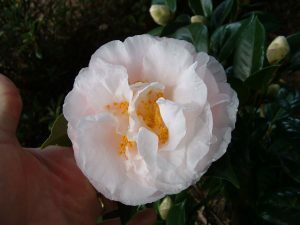 Camellias are flowering now – for us – sasanquas for the past few months and the mid and late season varieties are still full of flowers, and the japonicas are flowering now and will continue for a couple of months yet. In our area, flowering is all over by late September and it is getting too warm for the flowers to cope with the heat. The plants have been preparing for this flowering season for months – from January they start putting out flower buds waiting for the right time to flower. Once all these flowers have bloomed, that’s it for the season. They will start a new flush of growth in spring with another in summer, and then they will start budding up again in late summer ready for autumn flowering next year. Fertilise in early spring so that you get good new growth – that gives you new branches for flower buds to form on for next year. Get out into it, get your hands dirty and enjoy your garden. Posted on May 31, 2013 at 10:01 pm. 8.00 am to 3.00 pm – Saturday and Sunday – we will be open again to the public. Thousands of camellias – spread over 200 different varieties – sasanquas for the sun; japonicas, hybrids, species for part shade spots. Come and visit, walk the garden – yes it is a bit wet and I haven’t been able to mow, but look at the flowers not the weeds. Then buy some beautiful camellias – and vireya rhododendrons…..
And now a little more camellia culture – pruning. Camellias all take to being pruned and shaped. Sasanquas are used to make tall and short hedges or screens. In our garden, we have some camellias to 4 metres – but we also have some that we keep trimmed so that they stay about 1.5 to 2 metres, and others that we are keeping to less than 1 metre. So there are camellias for each different application. Talk to us about your camellia needs and we will offer you a solution. Prune at the start of spring, after the plant has flowered but before it starts to put on new growth. It is hard to prune off new growth – psychologically at least. A trim once in spring and perhaps another later for shape – this will control your camellias. Don’t prune hard after January – mid-summer – you will cut off a lot of the flowers for next season. Japonicas can be pruned too, just run the hedge shears over the top to keep plants to a manageable size – to the size you want. 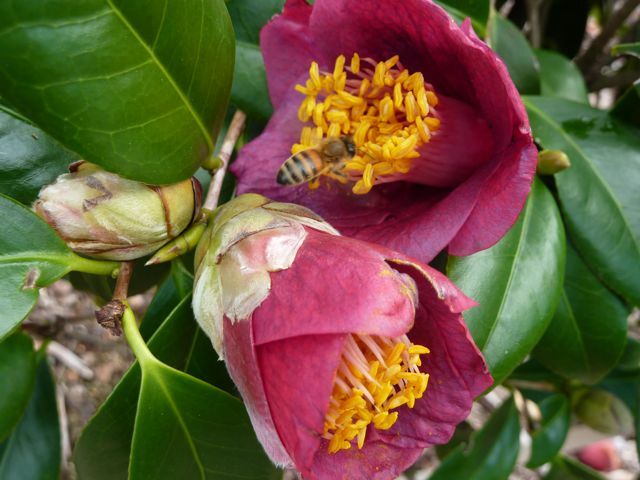 Feed your plants in spring as well – a good camellia food will do the job. Underfeed rather than chuck on too much. Have a good weekend – hope to see you here! Posted on May 24, 2013 at 10:54 pm. 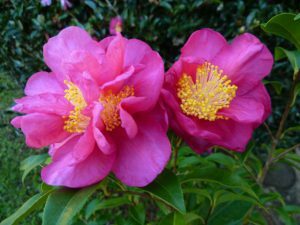 With so many people buying camellias, and in response to many questions, I thought I would do a bit more on camellia culture – what to do when you get your plants home. But firstly, we will be available – that is open to the public – on Saturday 25 May – 8.00 am to 3.00 pm; closed Sunday. 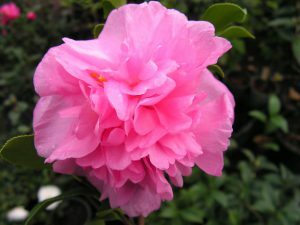 Come in on Saturday, wander the garden if you like, buy some camellias and vireya rhododendrons. 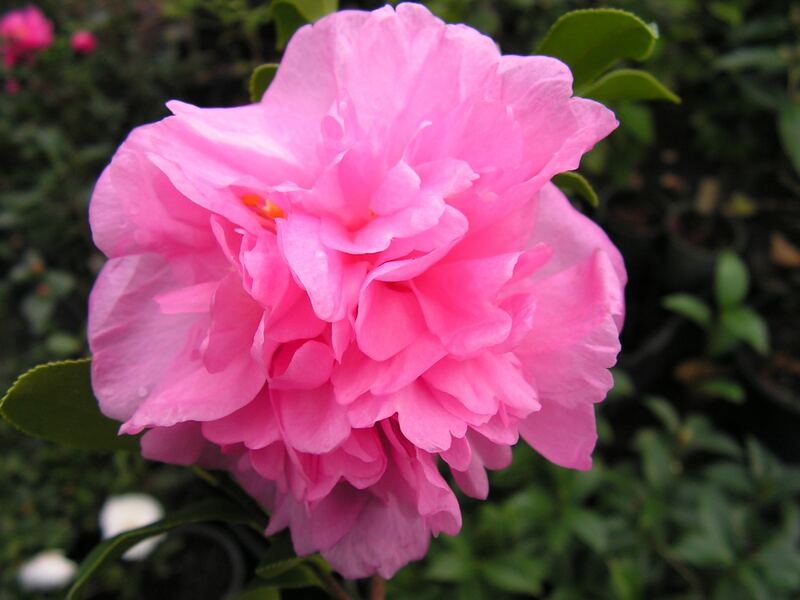 All this is covered in detail in the web site culture notes but… Camellias need a well drained acid soil – pH about 6.5 is good – over 7 is probably too alkaline. You can make your soil more acid by adding sulphur. Go to your garden centre and ask – but check the pH first. If the area is inclined to hold moisture, a raised bed is a good option – you do not want to plant in a wet spot as your camellias will get root rot and suffer – if not die. If you are not planting out immediately, put your plants in a semi-shaded position and make sure they are watered every day or two – and not just a sprinkle, water the pot so that all the potting mix is wet. If it has dried out, put the whole pot in a bucket of water for a few minutes and wait for all the air bubbles to stop – then the pot and the roots are wet. Take out of the bucket and let the water drain out freely. Remember that sasanquas can go in full sun, japonicas and hybrids should have part shade at least. When planting, pick your position wisely. Dig your hole twice as deep and as wide as the pot. Loosen the surrounding soil if it is solid and compacted. This will help the new roots. Add composted material to the backfill; use rotted cow and horse manures but not chook poo or mushroom compost – these can be too alkaline. You can add a spade-full or two of gravel or coarse sandy/gravely stuff – this helps drainage. Add a SMALL amount of fertiliser if you want to – the plant should have residual fertiliser in the mix and it should not need too much. Mix it all into the backfill – don’t dump it in the bottom of the hole – that just makes a place for the water to collect and that is not what we are trying to achieve. Tickle the roots out a bit so they can start growing out into the new soil, and not just stay in the pot shape. If the plant’s root system is solid and tending to be pot bound, then rake out the roots with a 3 pronged cultivator or similar and get those roots a bit loose. Try not to break off too many. If you have to do this, give the roots a soak in a seaweed solution to help recovery. Plant your new camellia in the hole, make sure that the top of the root ball is a little proud of the surrounding soil ie it is a bit higher than the surrounding soil after you used all the well mixed backfill and firmed it in. Water the plant in well. You can add seaweed solution to the watering-in water. Mulch well to a depth of 5 to 10 cm – this helps suppress weeds, keeps moisture in and keeps the soil insulated from extremes in temperatures. Stake young plants to help get them started – don’t tie them in too tightly and loosen and finally remove the tie so it does not strangle the plant. Water in at least once a week (unless you have had at least 10mm of rain). Watch for flowers if the plant has buds. The plant is dormant now and will not put on growth ’till spring – japonicas first then sasanquas – for us about August September. Then watch for aphids on the new growth – wipe or hose them off or use a systemic insecticide as per directions. Posted on July 16, 2012 at 4:50 pm. The Nursery will be open again Saturday 29 and Sunday 29 July – 8.00am to 3.00pm. Apologies to the folk who visited this past weekend and who were turned away or found us closed. We had a bit of an issue which ended up with me in an ambulance and off to hospital – but nothing broke and we are back on deck. So we will be open to the public again 28 and 29th July. Come for a drive, walk the garden – now that the rain has stopped – enjoy the camellias – and buy some, if that is what you would like. Grafting – now is probably the best time to try grafting that favourite camellia if you are wanting to get a few new plants of difficult to acquire varieties. Quite a number of japonica camellias are inconsiderately difficult to propagate from cuttings which we prefer to take in summer (December and January for us) when the new growth is just hardening off, and many reticulata camellias just about have to be grafted to be able to get a nice plant within a reasonable time. There are many places on the internet that will give tips on grafting. Now is a good time to give it a try. Some folk have indicated that some of their camellias are looking poorly – and one possible reason for us is the considerable rain we have had lately in SE Queensland. Have a walk around your garden and see where the water runs, either on the surface or below the surface, see if the water lies around for a few days or the ground is wet and slushy for an extended period of time. 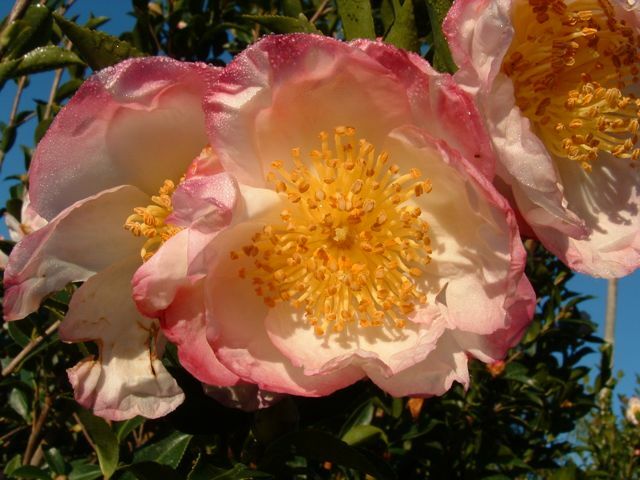 These are areas that camellias will not like – it is quite possibly too wet. 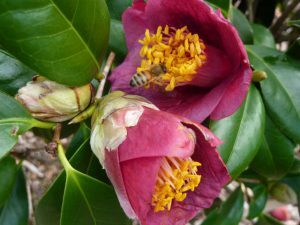 Camellias insist on a well drained soil, and moving your new camellia plants to a better position, or one prepared so as to give good drainage, will give you better results. Using coarse sand or gravel mixed in with the back-fill and mounding the plant up on a little hill is often sufficient to give enough drainage for the plant to survive those high rainfall events. This is a great time in the garden with many camellias in full bloom, some just starting and the retics yet to reach their peak – our magnolias are starting to colour up with flowers on Felix, Vulcan, Picture, Brozzonni, Royal Crown, Butterflies, soulangeana x Rustica Rubra (one of my favourites) along with many michelias like Silver Cloud and All Spice, with their fragrance filling the air all around the garden. The vireya rhododendrons are still flowering up with a dozen or so flowering with their heads of pinks, yellows, orange, bi-colour and reds splashing their colour around the garden. If it’s cold, put some extra clothes on, if it’s hot then take some off – just remember to be sun smart and leave your hat on! What a great time of the year to be a gardener! Posted on June 12, 2012 at 10:26 pm. Probably more later. Just call if you would like to visit at other times. 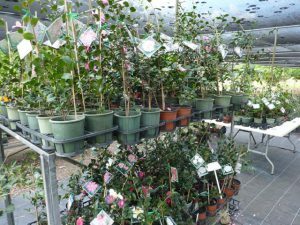 We still have many varieties available for sale – about 175 – but we are out of some – still a few thousand plants available. We are happy for folk to visit and just wander the garden – it’s not a display garden, but you can see a couple of hundred named camellias in flower as well as a number of vireya rhododendrons. The magnolias have a few flowers and will start in ernest in the coming few weeks.